Okay, now I am really rolling. 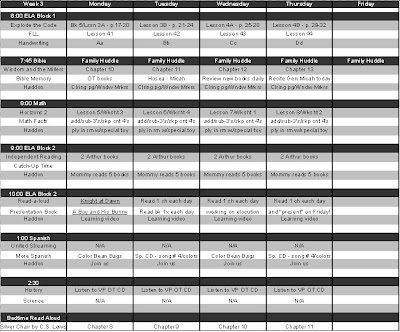 In addition to my Master Schedule, I also created a Weekly Lesson Plan form. I should say I borrowed a Weekly Lesson Plan form from my favorite of all blogs, Trivium Academy. I looked at several other forms on other blogs and websites but this one fit our needs best - at least for now! I am going to fill out this form each Sunday night, print it out and put it in my Teacher Notebook. It's simple black, white and gray because we don't have a color printer. When I made my "Year at a Glance" I had to have a friend print it out for me so all the colors would show. I am very hopeful about this week and am realizing that much of my frustration in the past two weeks was due to my unpreparedness - unknowingly unprepared but unprepared nonetheless! Now I have a schedule and a detailed lesson plan. Monday, here we come! Hope everyone has a wonderful week. I would love you see yours. You can click on my blogger profile and there's a place you can email me. Thanks so much! I saw your comment on my blog. I can give you the link to the place where I found the *free* 2 sidebar blog template. But I'll warn you... I lost all my widgets and buttons in the switch. I can talk you through it if you ever decide to take the plunge. My email is at yahoo. I bet you can't guess? really nice schedule. I am still in the contemplating making a schedule, but not actually doing anything about it-stage. Hi, I have been lurking for a week now just observing your plans for your little homeschool. Thank you for sharing them! I found you from Jessica's blog who is such an organizational inspiration. I just want to tell you that I linked to you from my site because I have borrowed some of your ideas... hope you don't mind. I'm Going to Read Fiction! Fun Idea for a Hot (Rainy, Snowy...) Day!